we've been reading chapter books out loud to the kids. I started right before Lincoln was born, just reading to Talmage before his nap. After we moved here, Sam and Wesley got to join in the fun as we started reading before bedtime, instead. but I thought it would be fun to start posting my thoughts on the book after we finish. 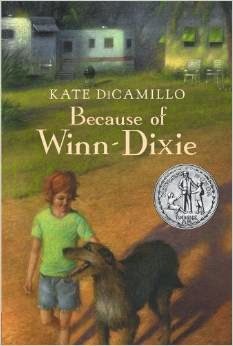 Because of Winn-Dixie is a sweet book set in southern Florida. The book features an endearing little girl, Opal, and her stray-dog-turned-pet, Winn-Dixie. and wind up gaining a lot of new friends through their escapades--because of Winn-Dixie. accepting others and our own situation while working to make it the best we can. however, there is some content that I chose to change as I read the story to make it more age-appropriate. Opal's mom was an alcoholic and left her family when Opal was just 3 years old. about the fact that her mom just decided she didn't want to be with their family anymore. So I chose to say, instead, that she had died. This made it so I needed to skip some sections where she talked with her dad about the likelihood of her mom coming back to their family. Overall, my kids loved the story and Sam and I enjoyed it as well. in which he spent a lot of time in little trailer parks. And I had fun trying out my different southern accents as I portrayed each of the characters. All in all, a charming, heart-warming book.